Arrival is a film I have been through-the-roof excited over for months. It's directed by Denis Villeneuve, who made Prisoners, which is a film I unabashedly love. It's been stuck at 100% on Rotten Tomatoes for a long time, with critics losing their minds over it. It's since dropped to more like 96%, but that is still an impressive feat. I love science fiction movies, so I was excited to see one that wasn't all explosions and laser beams, but a lot more serious. A thinking man's science fiction movie, one with more emphasis on the science, as this film has been previously described. So I went into this film with incredibly high expectations, expecting it to end up being one of my favorite movies of the year. Instead, I was disappointed. 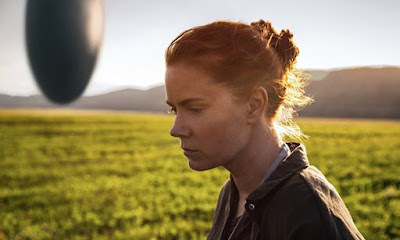 Arrival is a good movie, it just doesn't personally reach the hype that has surrounded it for so many months. After going through some terrible things in her past, linguist Dr. Louise Banks' (Amy Adams) life changes forever when they arrive! Twelve alien spacecrafts appear across the world, and no one knows what they want. 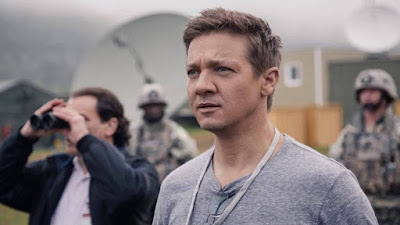 Colonel Weber (Forest Whitaker) recruits Louise and scientist Ian Donnelly (Jeremy Renner) to try to communicate with the aliens, and figure out why they are here. From a technical side, this film is brilliant. The cinematography by Bradford Young is breathtaking. Each and every shot is crafted carefully and meticulously, and it seems each shot tops the last. 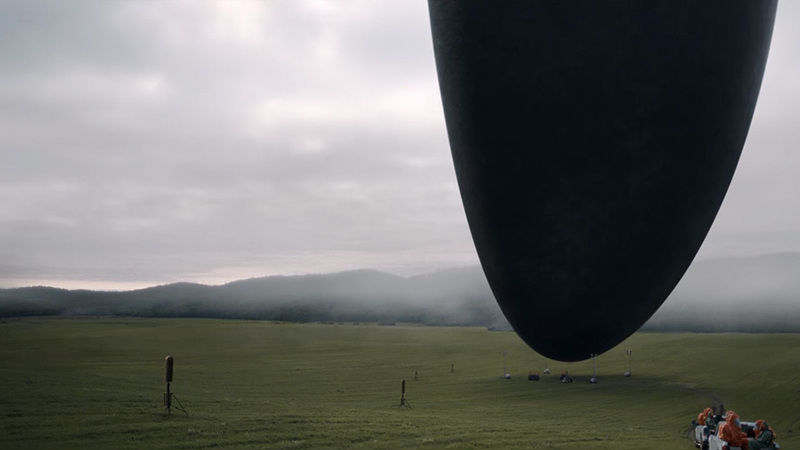 I think the cinematography from Arrival stands as my front-runner for Best Cinematography, along with The Light Between Oceans. Knowing that Young will be the DP on the Han Solo spin-off film, I was very curious to see what he brought to the table with Arrival, and he exceeded my expectations. I don't think this is Denis Villeneuve's best looking movie, however. Roger Deakins was the DP on Prisoners. I rewatched that movie after I saw Arrival, and I have to say that Deakins did a better job on Prisoners than Young did on Arrival. But he's Roger Deakins. Young did a fantastic job with this movie, and it is truly a visually beautiful film to watch. The score by Jóhann Jóhannsson was also incredible. It's a very subtle and quiet soundtrack, but it builds and escalates, and is truly powerful. The performances were good as well. I went in expecting Oscar-caliber performances, and we didn't quite get those. I don't think anyone will necessarily be nominated for an acting award, but they were still competent performances. Amy Adams does a great job carrying and leading the film, and Jeremy Renner is incredibly effective as a supporting character, especially with adding a sense of levity to the film. I wouldn't classify him as the comedic relief, because he was a lot more than that, but that's essentially what he did for the movie. Forest Whitaker's role is minor, but he gives a good performance. While most of my problems with Arrival stem from the story, I appreciated its new take on the classic alien invasion tale. I loved how it tackled the movie from the language aspect, because it was something we hadn't seen before. I appreciated the ingenuity that Villeneuve and writer Eric Heisserer brought to the table. This is a very slowly paced film, and that's not a bad thing. When done right, it can be incredibly effective. And I think it was effective-- for the most part. The problem is that the movie is so slowly paced for the first two acts, that the third act is rushed in order to have there be some sort of resolution, and because of this, a lot of things that are really important are glossed over. A twist is revealed in the third act that I really liked, but it kind of takes over the rest of the movie. The first two acts are all about the aliens and the efforts to communicate with them, and then the third act becomes all about the twist, and the true storyline is pushed to the wayside. When you look at the structure of the movie, you can tell it was a short story that was elongated and stretched out to make a feature film. When I left Arrival, I felt dissatisfied and discontent. I didn't feel like a lot of the questions I had were answered, and then there were aspects of the twist introduced that didn't make sense when you sat down and thought about the movie in its entirety. It's hard to talk about this because it's all spoiler territory, so I'm trying to stay vague. Watch the film and come back to this after, and this part will make more sense. Overall, Arrival is a good movie, just not the 5/5 masterpiece I thought it was going to be. It's technically impeccable. The cinematography by Bradford Young is impeccable, and shines as probably the best part of the movie. The score by Jóhann Jóhannsson is also very effective in its subtlety. While the performances aren't exactly Oscar-caliber, they work to carry the film and are good all around. Renner stands out the most as giving the film a sense of levity. I appreciated the film's innovation, and it's unique approach to a story that's been around pretty much as long as people have been making movies. But the film's structural problems and it's muddled narrative depreciates the overall movie. The slow pacing in the first two acts leads to a rushed third act, that is already balancing a twist which, while a good one, asks more questions than it answers. I ultimately walked away not feeling satisfied, with a lot of questions still remaining and my expectations not met. Arrival is a good movie, don't get me wrong. It just doesn't live up to the hype that's surrounded it for so many months. If you were through-the-roof excited to see it, check your expectations and see it. You'll probably get more out of it that way than I did. What do you think? Have you seen Arrival? Did you like the film? Leave your (spoiler-free) thoughts in the comments section below.